Underground Railroad Museum at Belmont Mansion in Philadelphia, PA.
We welcome your interest. We encourage you to contact us with any questions or inquiries you may have. Take the Schuylkill Expressway (Route 76) to the Montgomery Drive exit. Make a right at the bottom of the exit onto Montgomery Drive. Make a right at the first street (Belmont Mansion Drive). Proceed to the top of the hill to the Belmont Mansion. Take the Benjamin Franklin Parkway west toward the Art Museum circle pass in front of the museum. Drive down to West River Drive. Go west to Montgomery Drive (second light). Make a left onto Montgomery Drive. At first street (Belmont Mansion Drive) make a right. Proceed to the top of the hill to the Belmont Mansion. Take the Schuylkill Expressway to the City Line Avenue exit. Proceed south on City Line Avenue to Belmont Avenue (the fourth traffic light). Make a left onto Belmont Avenue. 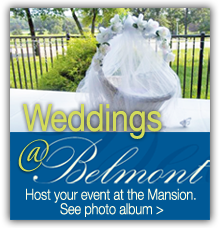 Follow Belmont Avenue to Belmont Mansion Drive. Make a left onto Belmont Mansion Drive. 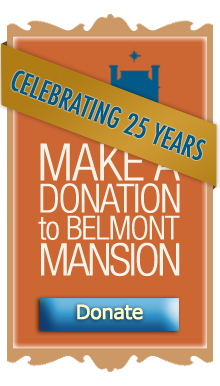 Follow around approximately ¼ mile to the Belmont Mansion. Like us on Facebook and follow us on Twitter to keep up with the latest news! 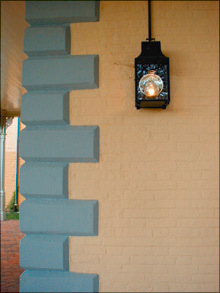 Outdoor light brightens the porch of Belmont Mansion.